I have just completed the transition of a well-established website from Drupal 7 to Backdrop. Although, as explained below, quite a significant amount of data has been involved, the main effort has been to rethink the design of the site from a fixed layout to one that is responsive and is much more suited to smartphones and iPads, while still looking good on more traditional screens. But why change? My first reason was that I needed to make this change to a responsive design, which could have been done in Drupal by using a different theme, but I was keen to take advantage of the many improvements being introduced in Backdrop for ease of administration, both for me as developer and for the site owner who is adding content almost every week. 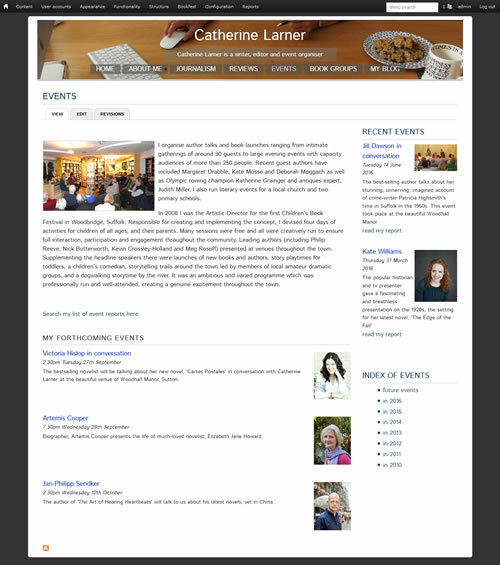 The site, www.catherinelarner.com, offers a growing collection of book reviews, reports of events that have been organized by the site owner, and a portfolio of her articles published in printed magazines, newspapers and journals. Each of these is stored as a record in appropriate tables in Backdrop’s database. The views module, an integral part of Backdrop, is used to provide listings and individual page views of these records. The data structures, content and views have fortunately transitioned fairly easily to Backdrop. Choosing a responsive theme and layout has been more of a challenge but easily met by the layout options built in to Backdrop that are so much easier to use than the optional panels module for Drupal 7. In order to provide a custom design for the site owner, I was looking for an established theme to use as a basis for a personalized subtheme. Very soon we will have a new theme ‘Basis’ for use with Backdrop, but to meet this immediate need I am using another Backdrop theme ‘Pretty in Purple’. This transition was not without its difficulties. The first was to make sure that the image files were all copied to the expected place in Backdrop. Because of the way I choose to install Drupal and Backdrop in folders /drupal7 and /backdrop on my server, I had to copy the image folders from Drupal’s public folder (drupal7/sites/default/files) to Backdrop’s at backdrop/drupal7/sites/default/files. Doing this meant that all the stored file references were still valid, provided they were relative to the root directory. The second problem was that in the Drupal site I had been using the Panels module together with Views for some pages and the change to using Layouts (also with Views) in Backdrop had resulted in some changes to the path names. Perhaps now with greater understanding of what is happening and a bit more initial planning I will avoid this in the future. My solution has been to add some redirects in the sites .htaccess file so that old URLs, known to search engines, translate to the new paths. A third challenge, yet to be mastered, is that the Drupal site made use of the add-on Rules, OAuth and Twitter modules to generate automatic tweets to the owners Twitter account each time she adds a new item (book, event or magazine article) to the site. This is a powerful facility that I hope soon to be able to port successfully to Backdrop, but at the moment I need a little help from my Backdrop friends.